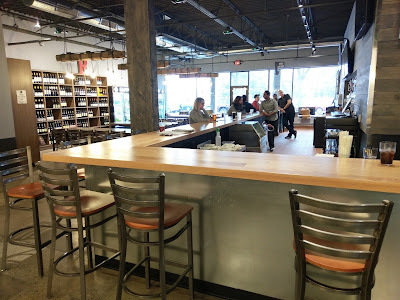 After about eight months of renovation, former beer and wine retailer The Wine Seller, located at 2721 Plymouth Rd. 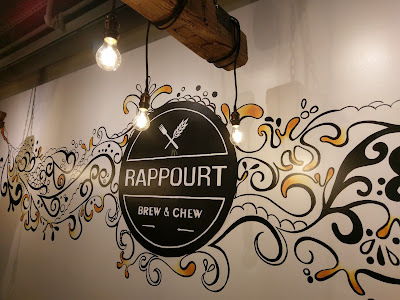 on Ann Arbor's north side, officially re-emerged today as Rappourt Brew & Chew, a 48-tap beer bar and eatery. It looks to be a welcome addition to this part of town, particularly as it's in my neck of the woods. 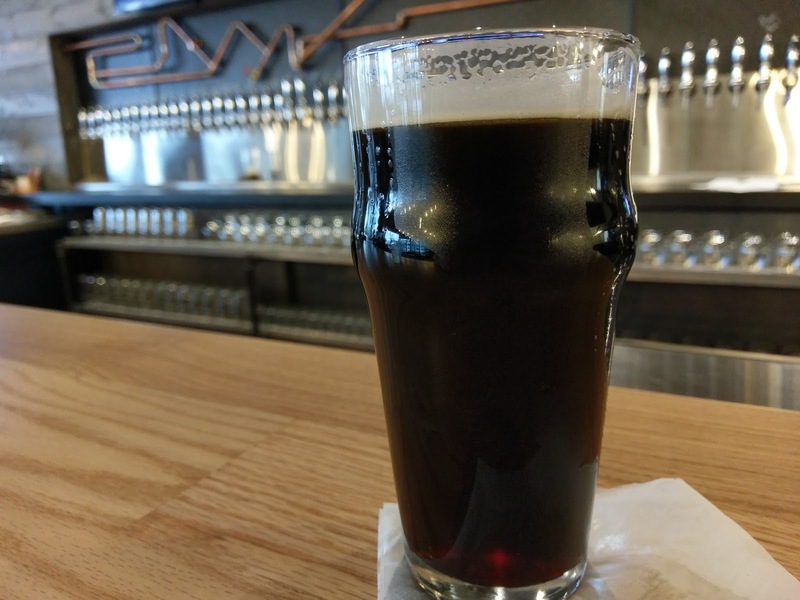 The new bar features a wide variety of drafts from around the country, like Prairie Artisan Bomb! Imperial Stout and Standard Saison from Oklahoma, and around the corner, like Witch's Hat Train Hopper IPA and Edward's Portly Brown Ale from South Lyon. A couple taps are also devoted to wine. The food menu, developed by Chef Dennis Kennedy, formerly of Ale Mary's Beer Hall in Royal Oak, is smallish but diverse. Dishes include a Fried Tomatillo BLT, Coconut Curry Mahi Mahi, Citrus Crab Cakes, and Chicken Enchilada Verde. There are also creative takes on old favorites; for example, the Watermelon Caprese Salad, with feta cheese, nicoise olives, and dried cherries, and the Rappourt Burger, with a chophouse blend of brisket and sirloin topped with gruyere cheese, mixed greens, roasted tomato, onion jam, and minted berry relish. A grand opening is planned for the spring, but for now things remain in a little bit of an experimental phase, according to Hardik Patel, one of the owners. Coming in the future will be a happy hour and beer and wine dinners. 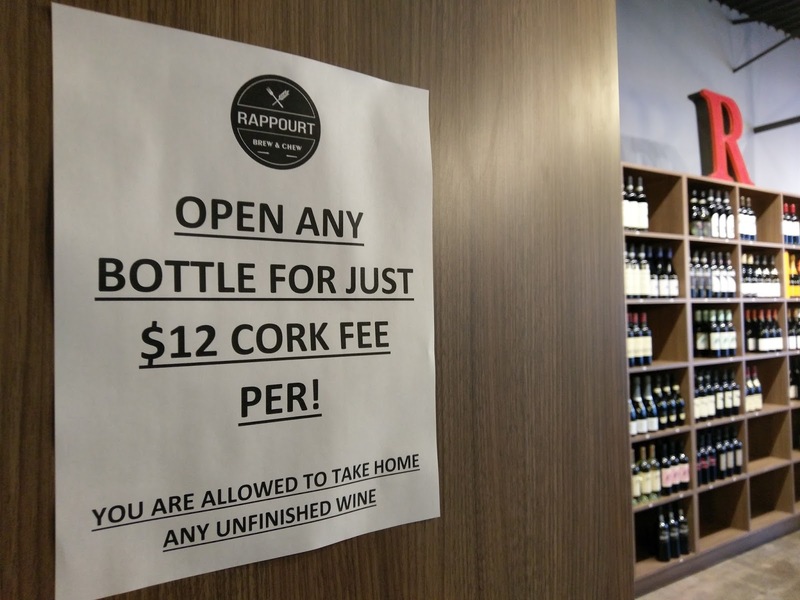 Speaking of wine, there's a substantial retail area, and you can select any bottle to open for a $12 corkage fee. Beer will be added to the retail area, though the focus will be mostly on draft, with growler fills being available eventually. Look for a menu of cocktails to be added in the future as well. The hours, also subject to tweaking, are as follows: 11 a.m. to 11 p.m. Monday through Thursday, 11 a.m. to midnight Friday and Saturday, and 11 a.m. to 9 p.m. Sunday. 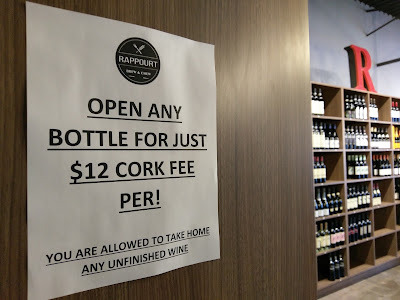 Follow Rappourt on Twitter and Facebook for the latest. I'll have a more informative update sometime in the near future.